RASMUS KLUMP PLAYGROUND - Hello! Because of its central location in Copenhagen, Tivoli Gardens attracts families with young children throughout the day. For them, the playground is the major attraction. However, public parks in the vicinity also have playgrounds of a very high standard. And they don’t charge admission. The old playground was lacking a clear entrance. The space was poorly defined and there was no sense of arrival. Most importantly, the site is on multiple levels and borders the street, so children could easily escape the area. It also has several large old trees that would need to be preserved and worked around. In short, Tivoli's playground was due for refurbishment. And for the first time ever we worked with an outside IP on the project. Enter Petzi (or Rasmus Klump as we know him in Danish). Petzi is a beloved cartoon character dating back to 1951. His popularity in Denmark is so great that a commemorative stamp was issued to celebrate his fiftieth ‘birthday’. The little bear likes to hang out with his friends and explore the world. Together they sail away on the good ship Mary. Wherever they end, they always find that a stranger is just a friend you haven't met yet. And they always come home, safe and sound, to Mother Bear's pancakes! Intensive studies of the universe of Petzi revealed what any Danish child could tell you: His adventures take place on or around water. And things that make noise are good. So are pancakes and big whales. To address the issues of arrival and enclosure, a long pathway with safedeck now leads up to the playground, which has been transformed into an enclosed area without giving the feeling of being fenced in. Along the path are several stops with play elements and a noisy musical playground. Columns with jumping jets adorn the path. The playground itself is divided into two areas: one for toddlers and one for older children. 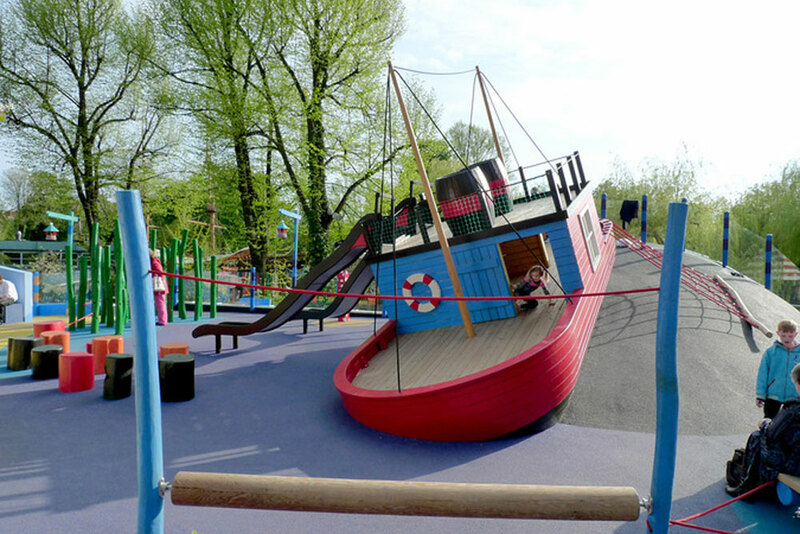 The toddler area features soft play elements and a water play area, while the other features the good ship Mary as a climbing structure. Altogether there are more than 40 play elements, a pancake restaurant and a Petzi-themed ride right next to the playground, creating a transition zone. Petzi's World was a success from day one. It has created a park within the park – a destination exclusively dedicated to the next generation of Tivoli visitors. The playground was planned together with the J Co, with renderings by Scott Neale.